No matter what your teenager says, safety above style is the Golden Rule. The vehicles with the highest safety ratings tend to fall into the late model vehicle category. Most cars come with standard safety equipment which include air bags, traction control, electronic stability control, and anti-lock brakes (ABS). Simply put, the newer the vehicle, the more advanced the safety features are. Safety features may help your auto policy’s bottom line; but be careful, the more safety features it has, the more expensive it will be to purchase (and to repair, replace, and insure). Talk about it! Read the reviews on the exact make, model, and year you chose. Look at what consumers say about the quality and durability of the vehicle. What are the biggest complaints about the vehicle? What are the best safety features? Purchasing a used vehicle is a safe bet for many and you may find great deals out there. However, before you put down that cash, you should also consider the vehicle’s history. You can find many used vehicles that have service records available, but if you and your teen choose something that doesn’t include those then be sure to have a trusted, certified auto mechanic look it over before you finalize the purchase. Keep in mind that the less you pay for a vehicle you should plan to pay more for maintenance or repairs. Remember, you are looking for something that is safe and reliable, and you often get what you pay for. 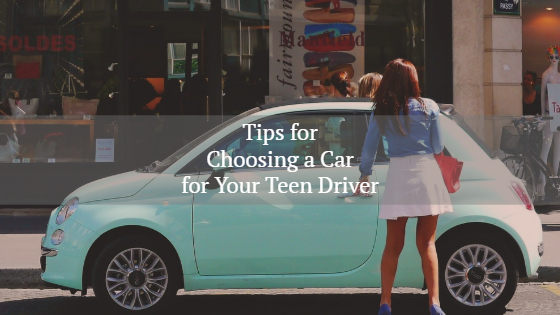 If you are unfamiliar with the make and model you and your teen choose, take time and do some research. Look for any recalls, and, if you find one, confirm that the issue was repaired on the specific vehicle you are purchasing. It’s better to pay more for a quality vehicle that will not drain your pocketbook than getting the deal of a lifetime and paying well over your budget in repairs and maintenance. Finally, it is always a good idea to make a checklist of what you and your teenager have decided are the most important features the vehicle should have. Keep an open mind and use your checklist when considering any vehicle. Remember to refer to Tip #1, Safety over Style every time. In the end, after the homework, dealerships, purchase, and properly insuring your new vehicle and driver, the most important part of your auto-buying experience should be the conversations you have with your teenager about auto safety and responsibility.